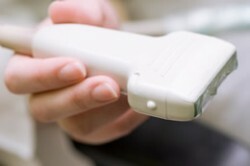 An ultrasound is a noninvasive, simple procedure that can be used for to diagnose many different conditions by producing images of the soft tissues, which often don't show up well on x-rays. There is no ionizing radiation used during this procedure, and no serious side effects. Do you need the box below on this page? For more information about Ultrasound, contact our New York or Brooklyn office to schedule an appointment.